David B. Culpepper’s Otto Depot, Wholesale Salvage Co.
We’d been on the hunt, off and on, for a piece of architectural salvage to create a new fence gate into our back yard. You see, we’d recently added a new patio and it was begging for a peek-a-boo gate so that everyone who drove up into our driveway could “Ooh” and “Aah” over it’s cobbled courtyard beauty. Culpepper’s Otto Depot in Otto, NC did not disappoint. 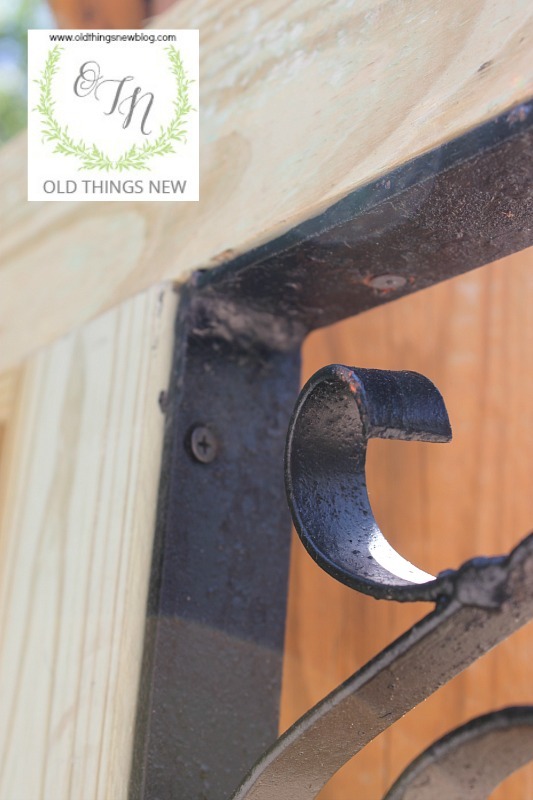 Hence this DIY post in which I tell you how Mr. OTN, with a little help from myself, built a Gate With Architectural Salvage. 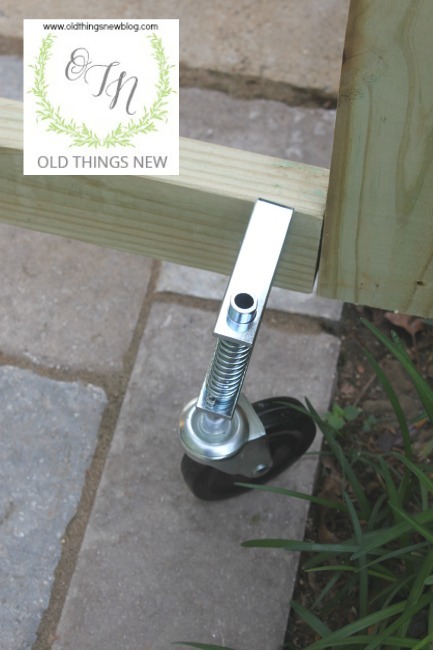 It all started out on the garage floor by taking measurements around this scrolly piece of iron, followed by 2 x 4’s cut to size, and laid in place for the drilling of diagonal holes using a cool tool called a jig. This is what the holes look like. A jig creates a diagonal channel for the screw to sink into, attaching one piece of 2 x 4 to another piece of 2 x 4 at a perpendicular angle. Savvy? This is what this cool tool looks like, and if you click on the picture below you can buy one for yourself. Or for your hubby who will think you are incredibly smart to know of such a tool and probably call you lots of sweet and mushy names. So here she is all screwed together and ready to hang where the old gate once lived. 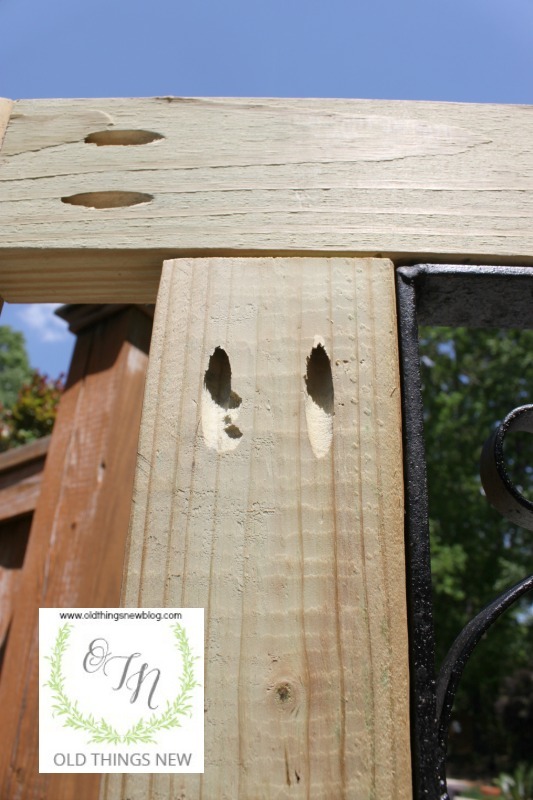 By the way, I almost forgot to show you how our pretty little architactural piece already had holes in place, making it perfect for attaching to the 2 x 4’s. It was like she was meant to be a part of our gate all along. 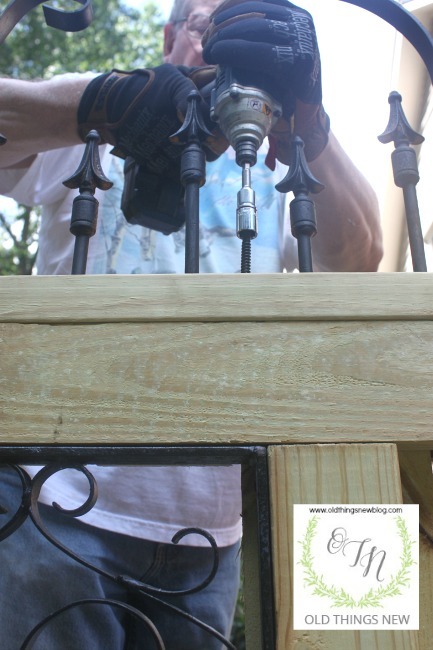 This is a picture of the hubs re-attaching the hardware we took off the old gate. We cleaned it up and added fresh black spray paint and it was as good as new. Since we knew this would be a heavy gate with all the iron pieces, we purchased this heavy duty gate wheel. It supports 200 pounds which is enough to carry myself and a very small friend! If you’re looking for a spring-loaded, heavy duty wheel, click on the picture above and check it out! Next came the fence boards. 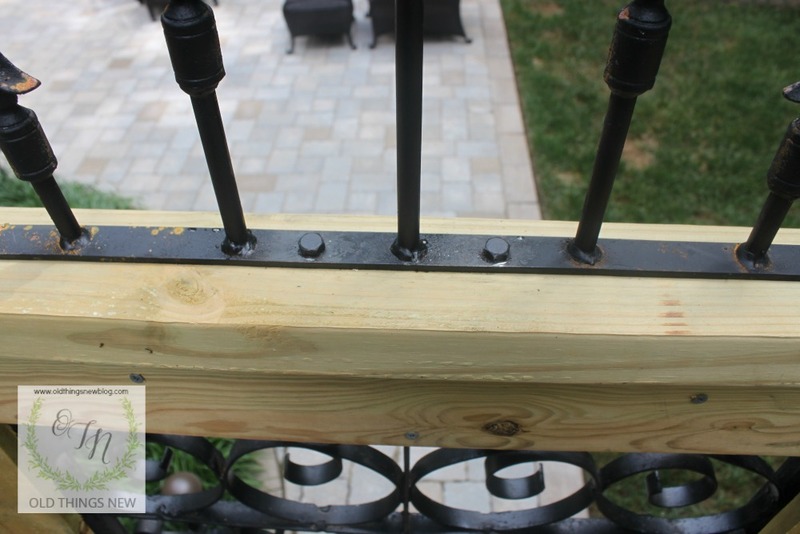 We screwed standard 5-1/2″ wide fence boards to the frame, leaving 1/4″ spacing between each board, and a 1-1/2″ clearance on the bottom of the gate. Note the narrower boards in the center of the gate. 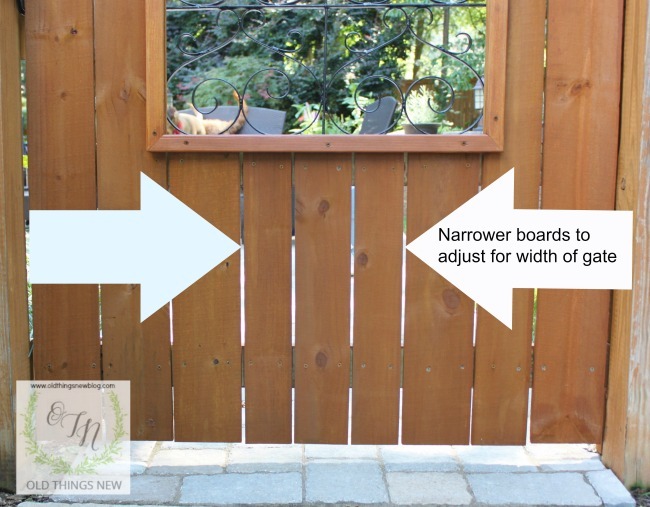 Our gate is 46″ wide, so we had to make some adjustments to the board widths to fit our gate. Mr. OTN ripped these babies on the table saw to make them the perfect size. And just in case you were wondering, this is the table saw Mr. OTN used. The one from his Top Ten Father’s Day list. 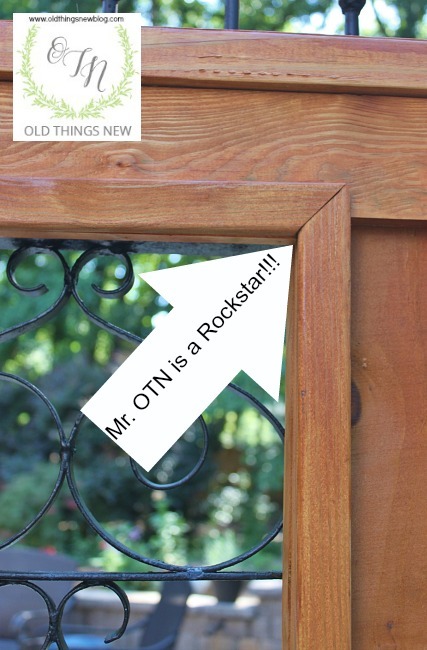 Mr. OTN trimmed the boards even across the top of the gate next. Sort of. But not to worry, he had a plan. 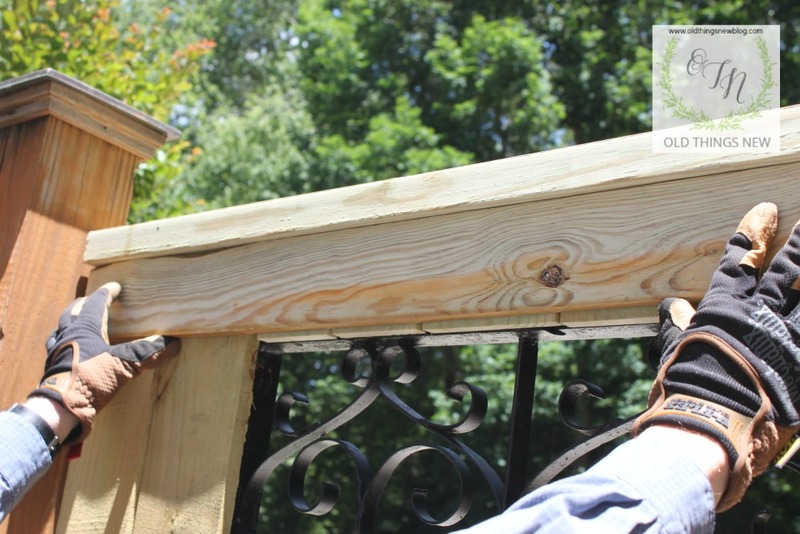 First though, he added another 2 x 4, laid flat across the top of the gate and screwed in place. 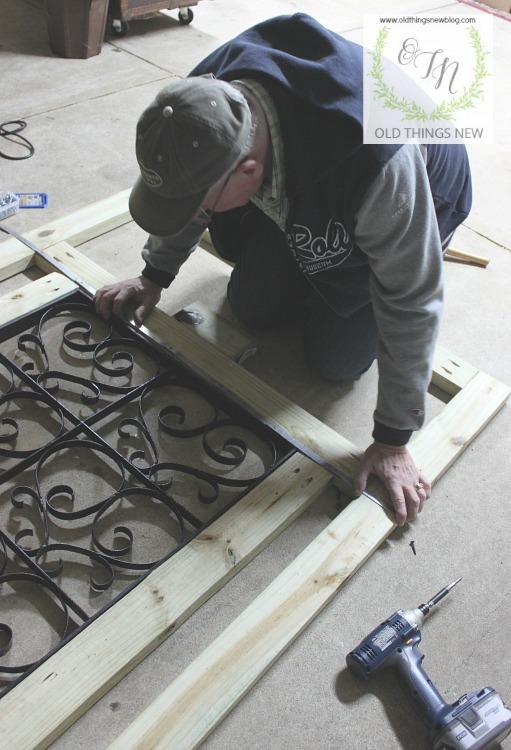 Here he’s carrying out his plan, which was to add a 1 x 4 piece to add visual interest to the gate (while at the same time covering uneven cuts). Notice the short fence boards showing beneath the 1 x 4? Mr. OTN had a plan for that as well. 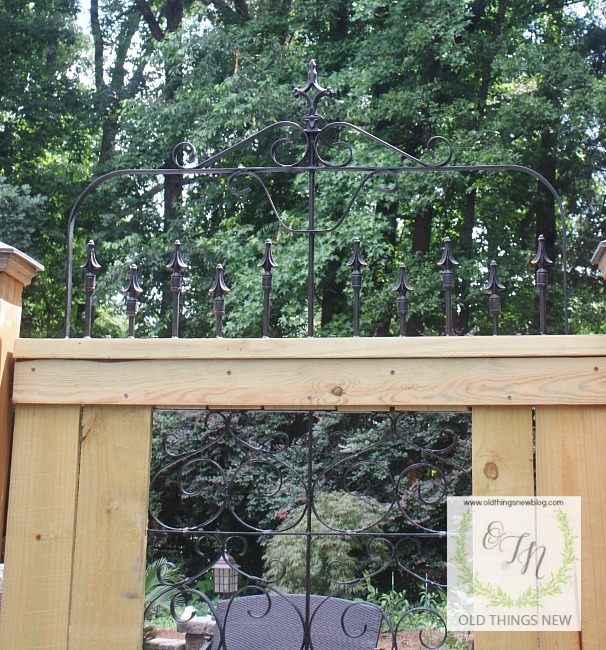 He had the great idea of adding a frame to highlight our salvaged ornamental iron piece, but since the “visually interesting” 1 x 4 across the top stands out beyond the fence boards he needed to use strips of shim to make the frame level. 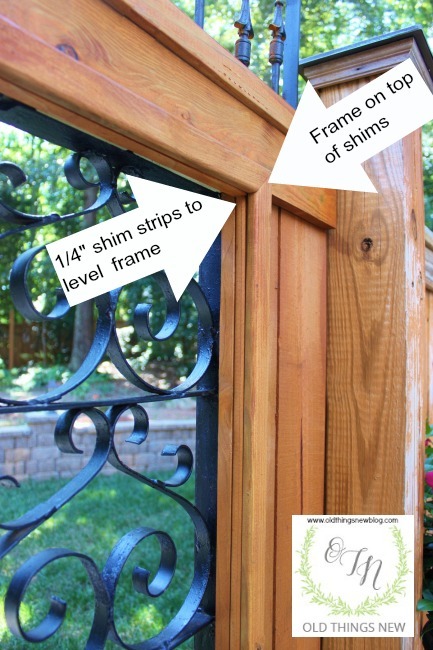 The shim he used across the top was a 1/4″ square strip cut the same width as the gate opening, and the strips of shim around the other three sides were the same width as the frame material. I was a wee bit nervous about the difficulty of creating mitered corners (based on my own past history) but Mr. OTN has great confidence in his abilities. Besides, he wasn’t worried about going out and buying a few more strips of wood if it didn’t work out! Next came the addition of a top for our gate. We wanted something with an arch and searched high and low through salvage yards, but couldn’t seem to find anything the right size. The piece came with pre-drilled holes (at our request) so it was ready to attach with heavy duty 2″ long, 7/16″ hex head screws. They look like this and you can order those here too, just by clicking on the pic. Isn’t she lovely? 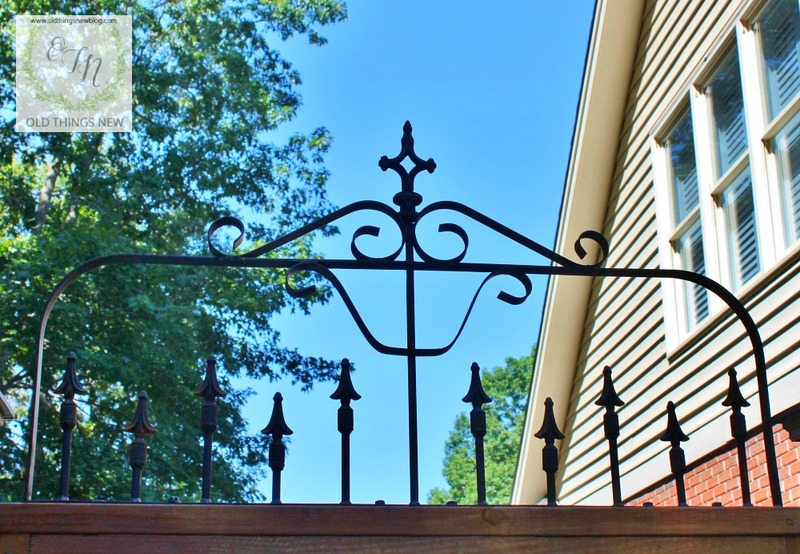 And she looks like she was made for the other ornamental iron piece in our gate. Which is no coincidence, because she was. Here’s another shot of her. She is so proud of herself that she asked if I’d share one more picture to stun you with her beauty. By the way, all of the iron pieces and the screws were spray painted with a light coat of black rustoleum. Just a light coating because I kind of like the rusty look showing though. It was mostly done for the benefit of our HOA who says we are allowed to have either wooden gates or iron gates only in our neighborhood. I’m already pushing the limits a bit by having a combination wooden-iron gate. It would really be a stretch if I left it au naturel from the get go. We’ll see how she patinas over time. 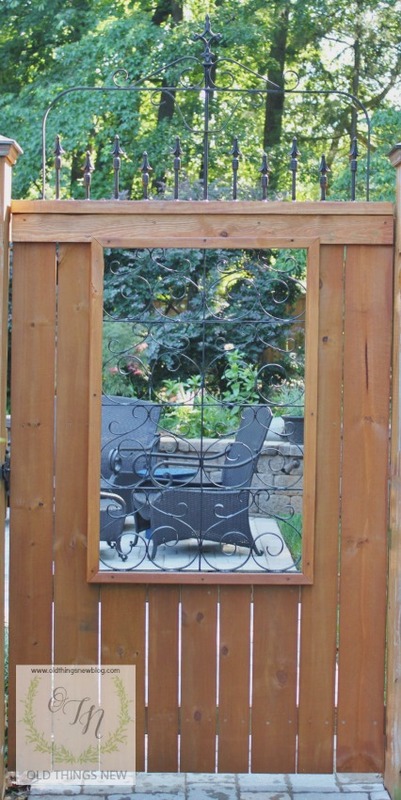 Here’s another look at our gate stained in solid Redwood by Olympic Stain to match the rest of the fence (which now looks faded and needs a touch up so it won’t be shown up by the beautiful gate). Mr. OTN did most of the work on this DIY project but I was a good enough helper that I warranted the label “darling” and a nice dinner out on the town. I would be delighted if you were to PIN me! And one more peek at our beautiful piece of architectural salvage, with a look through into the back yard at our new puppy and our new patio. I’ll be revealing that in an upcoming post so stay tuned. Finally, if you haven’t already taken my Reader Survey, I’d love if you’d do that today. Then, come on back here and leave a comment letting me know you’ve done so to be entered in a drawing for a $100 Amazon Gift Card. Just because I love you! I hope you’re enjoying the beauty of the Summer season in every butterfly, or white fluffy cloud, or sweet puppy you see. « Freedom Friday – Lavishly Loved by God & Me! I tweeted. I pinned. That Mr. OTN is one clever guy and his darling assistant is so talented and clever! LOVED THIS POST! OMG, Patti! 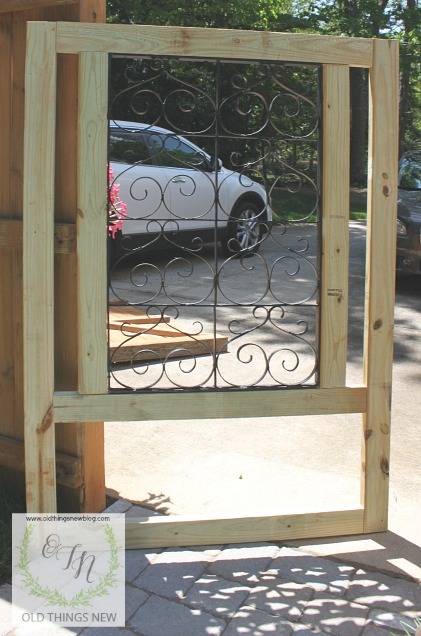 You weren’t kidding….you posted the DIY on this gorgeous gate. I don’t know which is “cuter”, the gate, the helper, or Mr OTN! lol. 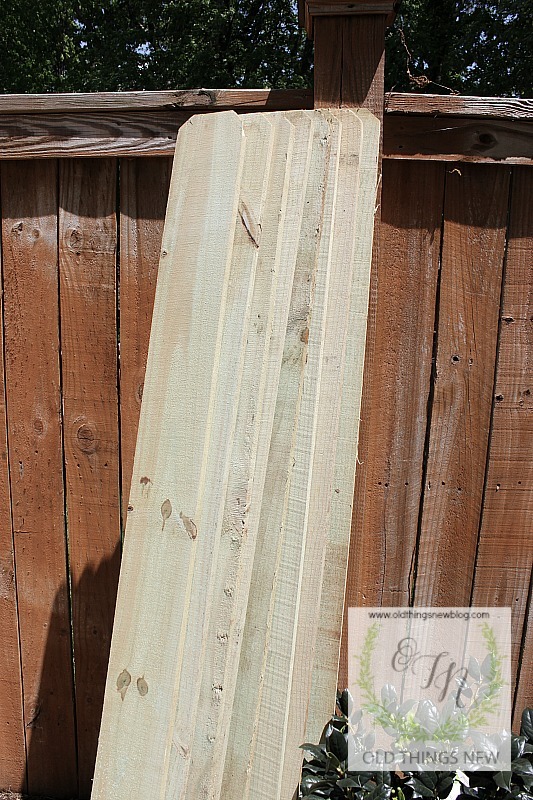 I think I could do this myself….I have my own miter saw and all kinds of power tools, but no table saw. Hmmm, Mother’s Day is long gone but my birthday is coming up in October. OH WAIT…no, our anniversary is in a couple of weeks….sigh, so many possibilities and I keep missing them because I have no table saw…. ;*) By the way, I pinned this one…. twice! one in my Garden Art, and one in Great Gates for Goodness Sake! Thanks, Patti….have an awesome and very blessed week. Muah! oh and I forgot…my hubby gave me my very own Kreg Jig last Christmas…woohoo! Am I a lucky girl, or what? Wow! You really are a Rockstar! 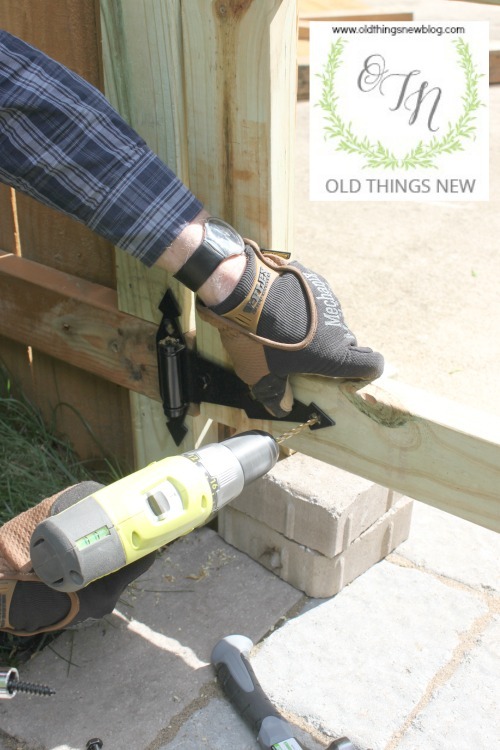 Why did I have no idea you liked tools too? Haha! You made me giggle out loud Sharon! You’re just like me . . . scheming how to buy something I want without feeling guilty. “It’s a birthday present to myself!” I am absolutely positive you COULD make your own gate and I hope you’ll go out and get a table saw if you really want one. Or at least rent one from a big box store for a day. Thank you for spreading the news about my garden gate sweet lady. I think the mister needs to do a few MORE project with me because they always seem to be a big hit! Blessings friend. Thank you so much Kath!!! This is such a great project. I love how the finished gate looks. You are so lucky to have such a handy husband. Thank you for the compliment. I am indeed lucky to have a handy hubby. Little secret? Sometimes he is a bit like Tim the Toolman. LOL! I’m so happy you came by and commented. I hope you’ll stop back again. 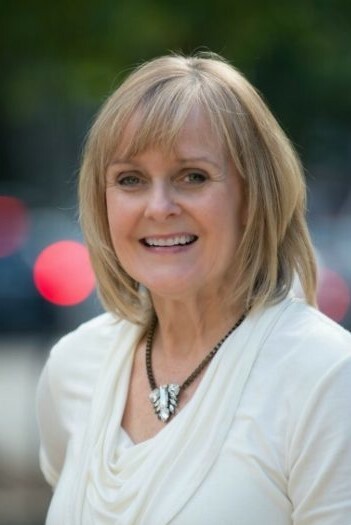 How beautiful Patti – I just found a place in the Albany area that sell old fences. I’ll be making a trip next week to find the perfect one for my pot rack. Thank you Rose!!! I am intrigued by the idea of using an old fence as a pot rack. I would love to see your project when completed. I have another, smaller, piece of gate that I’m still trying to decide how to use, but not big enough for something like that. You’ve got me thinking though. Have fun treasure hunting! Your gate is beautiful! I love taking old “junk” and finding a great use for it that creates a unique item and makes people ask “Where did you buy that?” 🙂 Very very nice job on that gate. Thank you my friend. I appreciate the compliment so much. The garden gate is beautiful! I love how it rolls on the pavers, and I especially like the wrought iron piece at the top, above the wooden frame. I absolutely love wandering through salvage yards. I’m so glad to see how you were able to turn a discarded, well-made item into a new work of art. 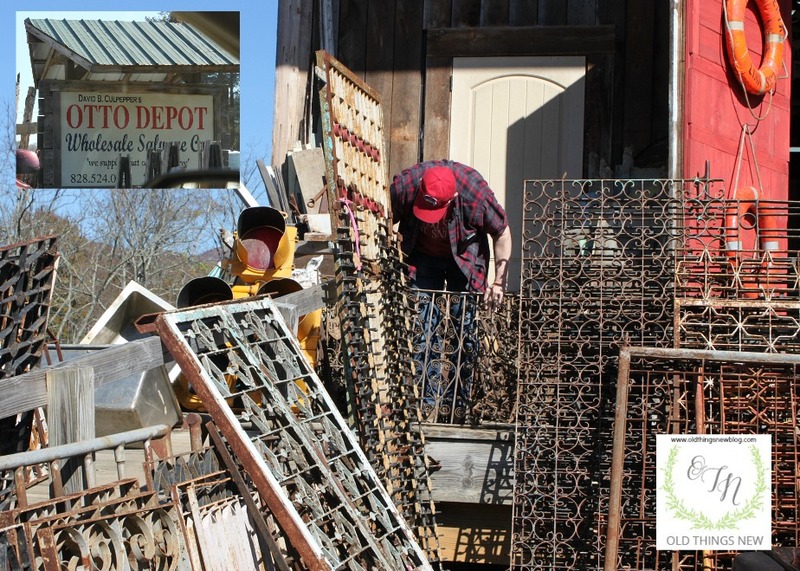 Wandering through salvage yards is the best past time ever! Thank you so much for liking our project Mimi. It means so much to me that you left a comment on it. What an amazing post! 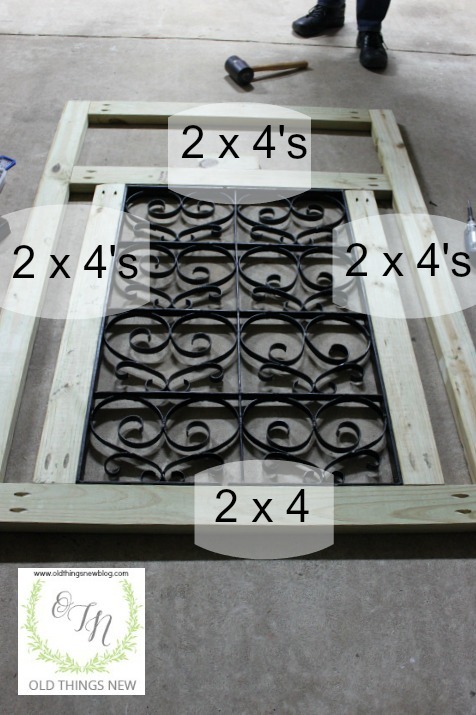 I am absolutely mad about architectural salvage, and I especially LOVE wrought iron. Oh, how I’d while away perusing all the pretty there. Your fence came out fabulously! I am mad about architectural salvage too! Isn’t it fun to search for the perfect piece? I so loved the gates into the Charleston gardens that I wanted a touch of that in my own yard. Thank you for coming by and letting me know what you think and please come again! That gate rocks! I have one similar that was here when I bought my house, but it needs some love and it’s not near as refined as the one he built. Gave me some inspiration! Thanks! 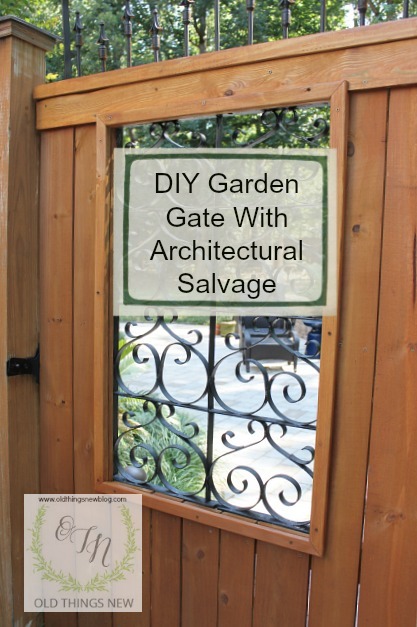 Patti, the architectural salvage piece was absolutely perfect for a gate. Your hubby and you did a fabulous job and the tutorial is excellent! Patti, the gate is wonderful, and yes he is a rock star!! Oh, and I do know what a jig is. 🙂 Thanks for sharing with SYC. Oh my goodness! Beautiful! I love stuff like this. I will be pinning this and will definitely be showing my hubby who is a fellow woodworker. Glad I found your site through the linky party! Thank you for the compliment and the Pin! Isn’t it great having a hubby who can help you with your pinned ideas? We are truly blessed 😉 I’m so happy you came on over for a visit and do hope you’ll come again soon. P.S. You came up with the perfect solution for straightening rope lights, and your bird cage light? Awesome! Oh thanks so much! Yes love pinterest;) Also thank you for the recent follow! Definitely will be back! What a beautiful gate, Patti! Your man is quite the artist. And you got a nice dinner out of of it too. 🙂 Win-win! Thank you dear Lisa. My hubby is a man of many talents and I’m extremely blessed! How awesome is that ! Thanks for sharing at Home Sweet Home! Wow! I absolutely love your Garden Gate! 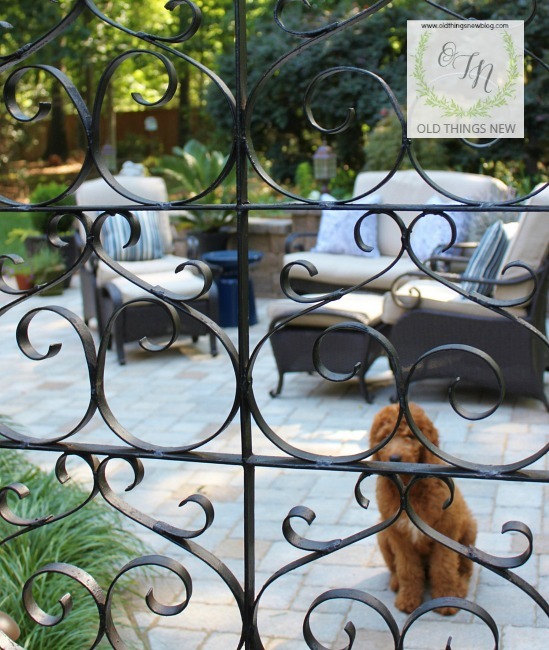 I’ve pinned it for later b/c this is very similar to what I’ve been telling my husband I wanted in a gate by our driveway. I see a project in our future! Thanks for sharing! Thank you pinning Kristy. Now get that hubby inspired! You made these gates from salvage material? I’m impressed! My wife and I are remodeling our front yard and are looking for ideas on building a fence. Thank you for the fencing tips. Thanks Linda. I appreciate the compliment! Thanks for sharing this post with us. These pictures are very beautiful. Good job!